Two-way communication, engagement, dialogue, conversations, collaboration, and participation are buzzwords in contemporary public communication practices such as political communication, government communication, relationship marketing, corporate communication, and public relations. Government, corporate, and many non-government organizations, with which citizens have to deal every day, spend millions of dollars, pounds, and Euros on public communication every year. But how well do organizations implement two-way communication, engagement and dialogue — in particular, how well do they listen — the essential corollary of speaking in communication? An international research study has found that, with some notable exceptions, organizations overwhelmingly create an ‘architecture of speaking’ with their substantial investments in public communication, designed and used to disseminate their messages. Despite their claims for two-way communication, engagement, and dialogue, they listen sporadically, selectively, and sometimes not at all. When organizations do listen, it is predominantly for instrumental purposes to serve their own interests, such as gaining intelligence to ‘target’ potential consumers of products and services. The two-year research project involved analysis of 36 case studies in three countries — the US, UK and Australia — explored through 104 interviews with senior communication practitioners, analysis of more than 400 relevant documents such as communication and consultation plans and reports, and 25 experiments testing organizational response. This study also explored the reasons for the “crisis of listening” in contemporary societies and the cultural, political, structural, resource, skill, and technological elements that are necessary to create an ‘architecture of listening’ in organizations. 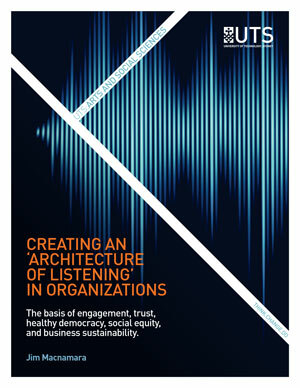 The study argues that there is an urgency to improve listening in government, political parties, corporations, and other types of organizations, and that there are major benefits from doing so, concluding that improved organizational listening is a key to citizen, customer, and stakeholder engagement; trust; healthy democracy; business sustainability; and social equity. This 75-page report presents a summary of the findings, conclusions, and recommendations of the study. A detailed analysis will be available in a book to be released in December 2015 — Organizational Listening: The Missing Essential in Speaking in Public Communication (Peter Lang, New York, 2016). © Copyright UTS - CRICOS Provider No: 00099F - 24 October 2018 04:18 PM. The page is authorised by Deputy Vice-Chancellor and Vice-President (Corporate Services).